January 29 | 2019. Tabasco! | Peter M. Schloss | J.D. - Mediator. 151 years ago financier Edmund Mcllhenny suffered the loss of his fortune and prospects having been a resident of Louisiana and a southern sympathizer during the Civil War. He had gifted his rare collection of the complete works of William Shakespeare to a Union officer rather than see the volumes lost to the looting Union troops. The collection was later returned to the Mcllhenny family and is now a treasure in their Tabasco Museum. While eating lunch he asked for some pepper sauce to liven up the otherwise bland fare. The proprietor demurred saying that peppers were out of season, but that he would pay dearly to have some. McIlhenny was thus inspired! Experimenting, he hit upon a process (not unlike making sauerkraut) of mashing select chili peppers, brining and aging the mash in white oak barrels (for up to 3 years), then extracting and bottling the pungent red elixir. Tabasco sauce was thus born. It has been exclusively produced on Avery Island ever since. The company exports world wide and prints its labels in 22 different languages. Control of the company has remained in the hands of the Mcllhenny/Avery family since its inception. Many of the executives have been known for their valor in the service of the United States Armed Forces, most notable being John Avery Mcllhenny who (literally) served next to Theodore Roosevelt as a Rough Rider in the Spanish American War battle of San Juan Hill. Others were notable adventurers such as “Ned” Avery Mcllhenny who was an Arctic explorer and naturalist. 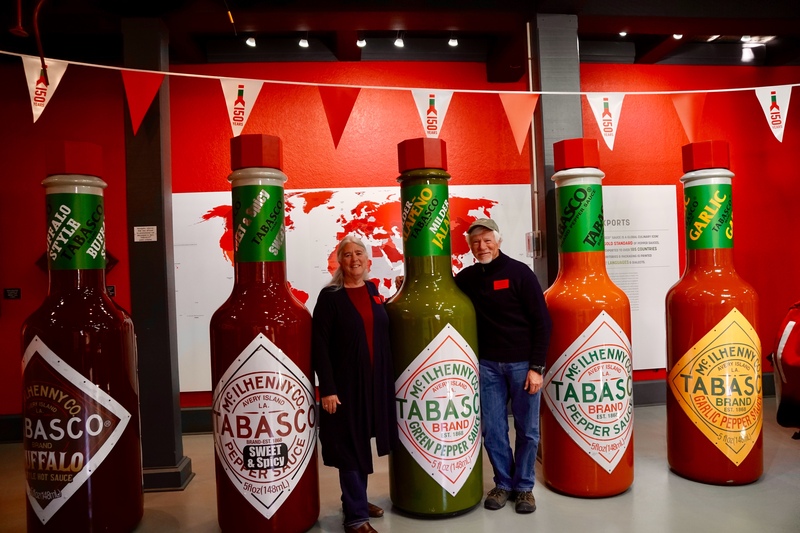 We toured the Tabasco factory today. It is entirely contained on Avery Island, named after Mcllhenny’s father-in-law, Judge Daniel Avery. It is a small circular island about 2.5 miles in diameter that was formed upon an ancient salt dome. The factory is remarkably small and understated when one considers the market strength of Tabasco products. On this day alone over a quarter million bottles of Tabasco sauce were filled for shipment to Japan. Many of the Tabasco employee families have multi-generational ties to the company, some living on the island in company furnished housing. One employee lived in the same company house for 89 of his 91 years! Most of us are familiar with “Original” Tabasco Sauce, it’s label design essentially unchanged for at least 135 years. Today I was treated to samples of a dizzying array of other Tabasco “tastes”, including Tabasco Scorpion Sauce. Christine could tell it had heat by the sweat rolling down my brow. There was even Tabasco Ice Cream! I have always been a fan of Tabasco, and those who remember me from my tie wearing lawyer days will recall that I had quite a collection of their neckwear. The last 2 nights we have been camped in Louisiana’s Palmetto Island State Park. It is perhaps one of the finest State Parks that we have encountered in our camping tour of 49 states. Spacious campsites, full utility hook-ups, WiFi throughout the campground, spotless bath facilities, and a free laundry! We are only 15 minutes from Abbeville, 40 minutes from Avery Island, and 120 miles from New Orleans, our destination for tomorrow. PS. Local temps are predicted to plunge to near freezing tonight. People in these parts are a bit frazzled by the cold-snap, but we are feeling pretty fortunate since Kansas City will be below zero, and where my Mom lives near Chicago will hit over 20 below zero… with a -60 degree windchill! Stay warm everyone! Enjoyed this note, Peter! Some of these products have graced my shelves over the years, but generally not for my consumption! Stay warm . . . it is unusual for me to see temps shut down a town! We would be horseback on sharp-shod hooves feeding heifers back in the day! I’m glad you enjoyed the post! I use hot sauce liberally. Tabasco is good but my favorite is Cholula. The armadillo is so ugly that he is cute! Your posts never cease to amaze me! Incredible adventure & amazing facts you find everywhere! Thank you! Thank you for following us Pat!! All this is so interesting about Tabasco. It gives me a new perspective of the little red bottle. It is 20 below–no mail, no paper, no banking., no school.– No TV or phone for 3 hours otherwise, we are comfortable. Yes, but by God you have indoor plumbing and real toilet paper… instead of the Sears Catalogues that Dad had to endure in the wastelands of North Dakota! Mom, I had forgotten that exchange from my college years! So true even 50+ years later!!! Love you. I saw a PBS program that blamed the guy who famously developed Tabasko Sauce as the culprit most responsible for importing the big swamp rats from South America way back when. They are invasive critters that are tearing up the coastal west lands now for almost 100 years. I think they are called nutria or some such and there is a $5 bounty on them. People make a living off of those bounties. I’ve heard a lot of stories about that island and yours is (as usual) pretty interesting. You are correct Steve, Nutria… and some folks find that they are a culinary delicacy! Sadly, not enough folks.